ussian Rhapsody is a piece for two pianos in E minor composed by Sergei Rachmaninoff in 1891, when he was 18. It is more accurately described as a set of variations on a theme, rather than a true rhapsody. It was premiered on October 29, 1891, and its performance lasts approximately nine minutes. While still a student at Moscow Conservatory, Rachmaninoff wrote to Natalia Skalon on January 22, 1891 [O.S. January 10] mentioning that he had begun work on a piece for two pianos that he wanted to play with Alexander "Sasha" Siloti. Although, he dated the manuscript January 1215, 1891 [O.S. ], implying that he had the composition in his head at the time of the letter, and only recorded the days he notated it on paper. Despite his stated intentions, he began rehearsing with Leonid Maximov, who had been a fellow student of Nikolai Zverev and pupil of Siloti, to play at a student concert at the Conservatory on March 8, 1891. However, Zverev, still upset over Rachmaninoff's request for a separate composing room, did not allow them to play together, so at the concert Rachmaninoff ended up conducting his choral work Deus Meus (1890) instead. The Rhapsody received its premiere after he graduated, on October 29, 1891, in a performance by Rachmaninoff and Josef Lhévinne at the Conservatory. The piece is more often described as a set of variations rather than a true rhapsody, and a letter from Rachmaninoff's friend Vladimir Wilshaw describes the possible origin of the composition as a session in which Rachmaninoff improvised on a melody set forth by pianist Yuri Sakhnovsky. Although both he and Lhévinne were more than capable performers, after the premiere, Rachmaninoff considerably simplified three passages. This is cited as the first of many future instances in which he would revise some of his pieces for no apparent reason, since it could not have been the ability of the performers that caused him to do so. It is natural for a composition of variations to repeat the theme, but it is noted that the Rhapsody lacks the textural contrast shown in his later works, although it is very virtuosic and brilliant. 1. Matthew-Walker, Robert (1984). Rachmaninoff: The Illustrated Lives of the Great Composers. London: Omnibus. p. 22. ISBN 0-7119-0253-4. 2. Harrison, Max (2006). Rachmaninoff: Life, Works, Recordings. London: Continuum. pp. 28, 52. ISBN 0-8264-9312-2. 3. Sergei Rachmaninoff (January 22 1891 [O.S. January 10]). "Letters of Rachmaninoff". Senar. Retrieved 2008-06-28. 4. Bertensson, Sergei; Jay Leyda (2001). Sergei Rachmaninoff: A Lifetime in Music. Bloomington, Indiana: Indiana University. pp. 3132. ISBN 0-253-21421-1. 5. Hinson, Maurice (2001). Music for More than One Piano: An Annotated Guide. Bloomington, Indiana: Indiana University. p. 157. ISBN 0-253-21457-2.
olf Plagge and Wolfgang Manz came to prominence after their remarkable successes at international piano competitions such as Leeds, Brussels, Warsaw and Moscow where they won major prizes. Today they belong to the most distinguished pianists of their generation. Both have completed their studies at the renowned "Hochschule für Musik und Theater" in Hanover; both have received many rewards and various scholarships. Apart from their extensive activities as soloists in Germany and abroad, Rolf Plagge and Wolfgang Manz formed a piano duet in 1988 called Duo "Reine Elisabeth", in commemoration to the world-famous piano competition "Concours Reine Elisabeth" in Brussels, Belgium, in which their successful participation in 1983 and 1987 launched their international careers. The DUO has performed in several European countries as well as in Middle and South America (Chile, Mexico). Both pianists have played together with famous conductors like Bernhard Klee, Pierre Bartholomée, Christian Kluttig, Frank Beermann and others. There is a large repertoire available reaching from the baroque style to the classic, romantic and modern eras. Apart from classical and romantic programmes both pianists also feature works of contemporary composers such as Volker Blumenthaler, Richard Heller, Karl Thieme, Frédéric van Rossum, Daniel Capelletti or Piet Swerts. A special achievement of the DUO is the performance of rare transcriptions of well-known orchestral works and ballets: Igor Stravinsky's "Petrushka", "Le Sacre du Printemps", Franz Liszt's version of the Ninth Symphony of Beethoven for 2 pianos, Aram Chatchaturjan's ballets "Gayaneh" and "Spartak" or the Piano Concerto-Fantasy on Chinese Folk Tales by Alexander Tcherepnin. In the opera houses in Leipzig and Karlsruhe the "Sacre" has been performed by the DUO over twenty times in different choreographies (Uwe Scholz, Davide Bombana). 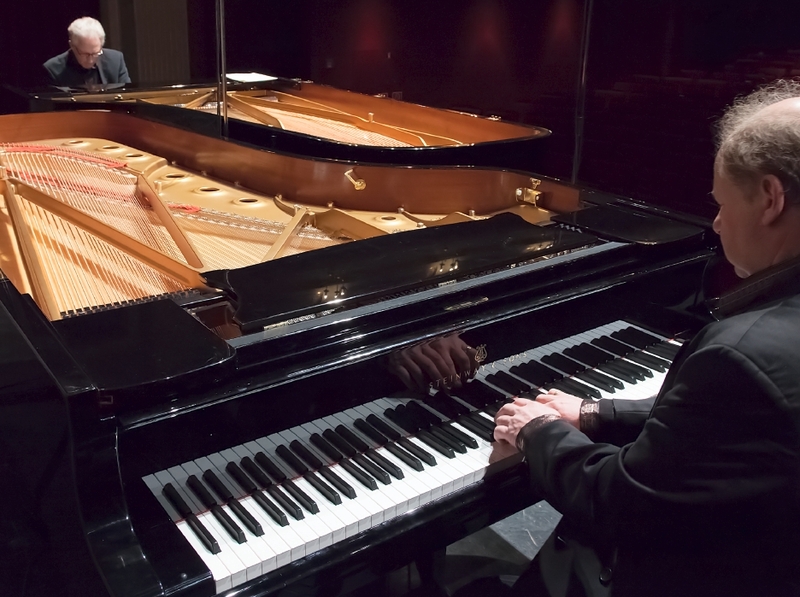 Both pianists are teaching as professors at famous music universities. Rolf Plagge is chairman of all juries and boards for pedagogic piano studies at the Mozarteum in Salzburg, Wolfgang Manz is member of the senate and head of the keyboard section at the Nürnberg University of Music. Several CDs have so far been produced. 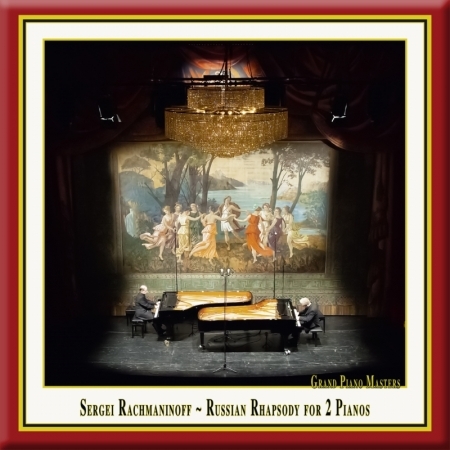 Besides works of Sergej Rachmaninov, Dimitri Schostakowitsch and Alexander Scriabine, the EMS CD ("Russian Music I") presents an adaptation for two pianos of Igor Stravinsky's ballet "Petrushka" as complete version of all four scenes created by the DUO.